DVcreators.net Tutorial DVDs Tip: Why can't I see my navigation buttons? 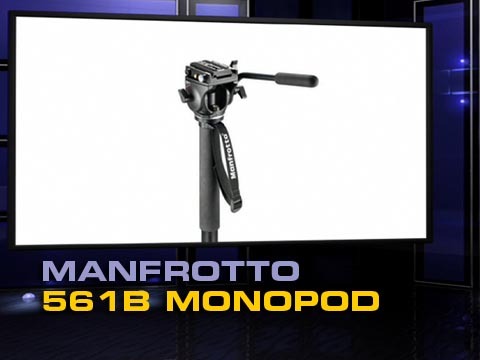 This new wave monopod was so popular at the NAB tradeshow in Vegas, that everyone who got their hands on it kept asking the same question, “Can I buy this one?” It’s that cool. When you pan and feel how smooth the action is you’ll fall in love with it. The 561BHDV is a 4-section aluminum monopod. It is equipped with a fluid head able to support up to 8.8 lbs. The key feature of this monopod is the fluid cartridge incorporated into the base that gives you an incredibly smooth panning action. The fluid video head (similar to the 701RC2) features a new sliding plate which was made specifically for this model. The ergonomic pan-bar allows smooth panning and tilting movements. Small and lightweight, this video head is ideal when combined with the high performance of the 561BHDV monopod. The three retractable feet ensure a firm footing, and of course the fluid cartridge helps Videographers obtain superior images. Consider adding the 521PRO LANC controller for camera control. A brand new addition to the Lens Control range, the 521CFI puts all the functions of the 524CFI in a smaller clamp control suitable for use with the 595B Fig Rig, with jib arms and in a wide variety of other shooting setups, allowing the video operator to take full advantage of the latest compact HD camcorders with interchangeable lenses.The 521CFI offers the following controls: stepless progressive zoom, record/stop and RET (return – plays back last 3 seconds of footage, then stops at the last recorded frame ready to record again). The small side-mounted dial allows you to quickly and easily limit the maximum zoom speed to avoid too-fast transitions, while the zoom direction switch (also on the side of the unit) lets you change from left-right to right-left zooming. Rain cover available as accessory (523RC). The 521PRO is the top of the range for LANC enabled cameras. Key features include the ability to use the zoom wheel for either focus (in/out) or zoom (in/out) and an added push-button auto focus feature. Cool Idea, can I take the head off and stick it on my tripod???? Well looks like Santa is going to have to buy me one. I was just shooting power parigliders and my tripod did not do the job. Sure hope this will as my arms are sore. does the 561b use the same plate as the 503 head? if not is there a monopod that does? Yes! it uses the same plate. You are all set to go. I’m torn on this one. I purchased it and like it a great deal, but I was also considering a tripod. I have a Panasonic AG-HSC1U, very small AVCHD video camera. I was hoping this would be versatile enough where I could tranfer the head to a tripod if I get one in the future. wouldnt I have more versatility if I purchased the 560B, rather than the 561B, then put a 701RC2 head on it? I know I would be doubling up on fluid pan because I would have it in the head and at the base of the monopod, but couldn’t I simply lock down the pan control on the head and utilize the base when on the monopod, then if I want to transfer the head to a tripod? If I keep the 561B I’m stuck with this “modified” 701RC2, which from what I can see the modifications are that it uses a different plate and most importantly has no pan control. Any idea where you could get a good monopod case for this? hi, can the head be locked so it doesn’t move (tilted at an certain angle) and be used in a flag pole position and then use fluid foot to pan. I’ve used this product extensively. Yes the fluid base works but there are some drawbacks. The whole rig rests on a three legged base, and is attached by a ball. I’ve found that many times I’ll be half way through a pan, and the ball will glitch because I have ever so slightly put some pressure forwards or backwards. Yeah, so of course don’t do that right? Well it’s a little harder than it sounds. My tip would be to set up your shot, then rotate the mono with two fingers from each hand barely touching the thing.